CLC President Hassan Yussuff welcomed Prime Minister Justin Trudeau to the gathering of labour leaders. CWA Canada President Martin O’Hanlon was among a gathering of union leaders who heard from Justin Trudeau this morning that he is hitting the reset button on the federal government’s dealings with the labour movement. The new Prime Minister said in his speech to the Canadian Labour Congress (CLC) that he looks forward to working together with labour on a common goal of a better future for families. It was the first time since 1958 that a sitting prime minister had addressed the CLC. 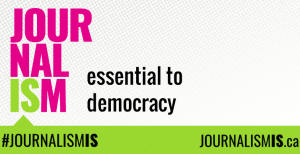 More than 120 labour leaders and representatives are in Ottawa for a meeting of the Canadian Council, a democratically elected group that governs the CLC between its national conventions. 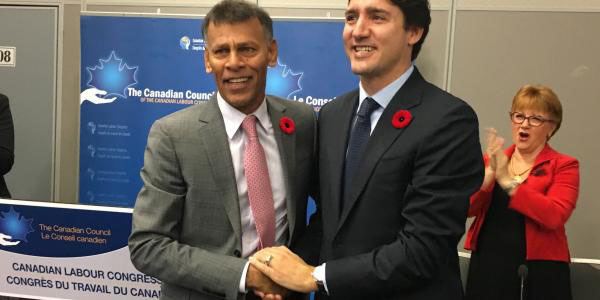 “We were happy to welcome the Prime Minister to our meeting, and to hear him recommit to repealing the former Conservative government’s anti-union legislation, C-377 and C-525,” CLC President Hassan Yussuff said in a news release. “We had a positive discussion and emphasized that we look forward to working with the Prime Minister and his cabinet on a number of issues that are priorities for working Canadians,” he added. 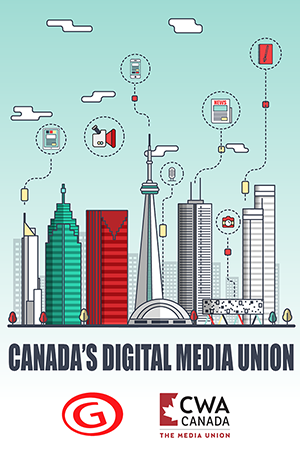 The CLC represents more than 3.3 million union members who work in every industry and live in every province and territory.